UTF-8 Unicode support! ES can now display glyphs from non-English languages (like Japanese), and most common non-ASCII characters work. If a font is missing a glyph that something needs, ES will try to fall back to a system font. The system font list is not exhaustive and is operating system dependent, so if your language isn't working, please open a GitHub issue with a suggested font that everyone on your operating system should already have. IME input is still kind of broken. If enough people want this I'll try and add it, but I don't expect many people to be entering much text in ES in the first place. %ROM% works properly on Windows now – it is equivalent to "%ROM_RAW%"
Hide the console window on Windows unless the "–debug" argument is present (Windows). Launching a game currently still opens a command prompt window, though. Optimized some blurred system backgrounds where banding occured. All of these changes are in the new 2.0.1a release, available now on the EmulationStation website! If you have an existing installation, you should be able to install 2.0.1a over top of it (but note that if you choose to reinstall the default themes, it will overwrite any modifications you have made). It is strongly advised that you back up your $HOME/.emulationstation folder before updating. There is also a new official EmulationStation forum! If you are looking for help, you might be able to get it here. I'm also trying to move feature requests off GitHub and onto the forum, as the GitHub issue tracker is pretty packed right now. There is another change I've been working on that isn't quite ready for release yet (and been promising for quite a while): a rewrite of the metadata storage code to use an SQLite database instead of XML. This speeds up saving considerably for large game lists, which gets rid of some of the long hangs seen during scraping and makes ES close instantly. The way files are stored internally has also been reworked to match this database, which makes it possible to do useful queries and sorting via SQL. It's also easy to import/export the current XML format to/from the database. This change was just merged into unstable. I would appreciate testing, since it changed a lot of stuff. 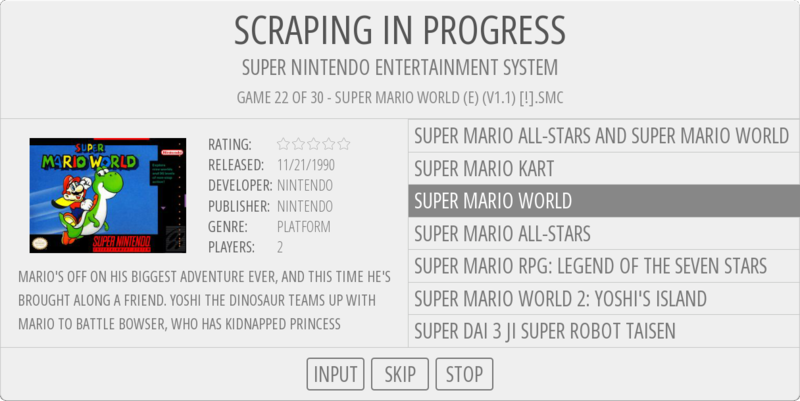 A community member by the name of sselph built a nice checksum-based scraper, which means it matches games based on the content of your ROM file rather than the name of that file. This almost guarantees no false positives, making scraping waaay faster and waaay more accurate. It's been merged into the unstable branch as well. The ES scraping system could use some work to support multiple scraper fall-through (when one scraper has no results, go to the next one) and scrapers with certain plaform affinities. Add the ability to configure emulators from within ES (including setting controls). This requires some pretty serious design work and is something I'd like to at least lay the groundwork for myself. Add another type of game list view that shows games by image (sort of like an album view). Make it easier to set up ES, especially on Windows. As it stands, ES needs some work to handle the systems list changing while ES is running. The gamelistdb branch is starting to take steps towards this. Ideally, this could be integrated with the "configure emulators" stuff to provide some simple autodetect system (give ES a bunch of emulator directories, have it automatically detect which emulators are present). An external tool might be an easier way to do this. Try porting ES to Android. SDL2 supports Android, and ES uses OpenGL ES 1.x to render everything. I think most of the libraries ES uses will work on Android. Touch control would not be supported. This will probably entail a couple days of fighting with build systems. If anyone else wants to give this a shot, go for it. Add a "UI Language" option to ES. DigitalLumberjack has already done some work on this. And finally, thanks for the huge amount of support you guys have shown. This entry was posted in releases on March 6, 2015 by Aloshi. After 10 months of relative silence, we’re finally ready to release. 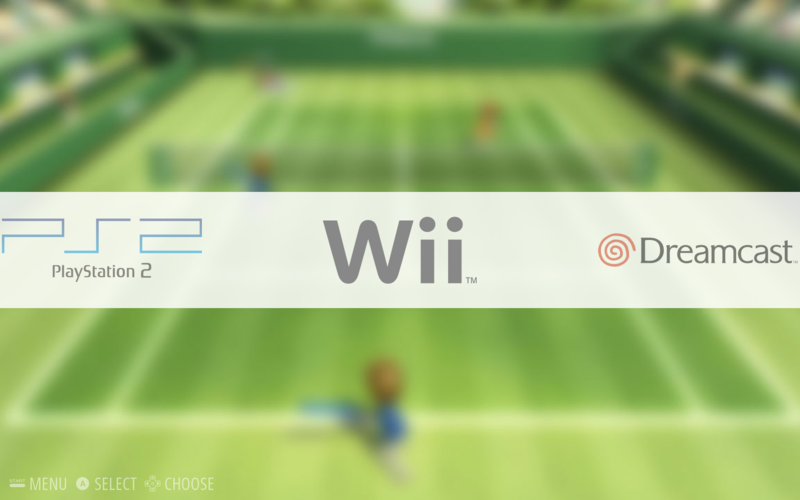 We are proud to present EmulationStation 2.0, release candidate 1! 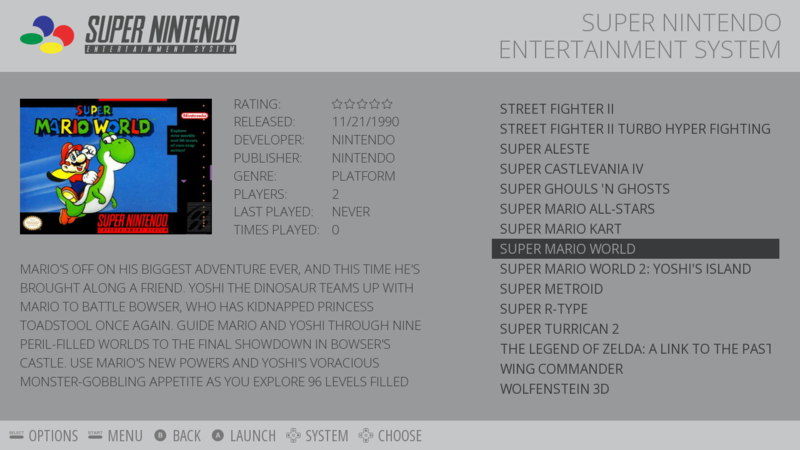 For those who don’t know, EmulationStation is the front-end for the popular Raspberry Pi retro gaming distribution. It also runs on Windows and most flavors of Linux. There’s an <include> tag now! No more defining fonts/sounds by hand across 30 systems! 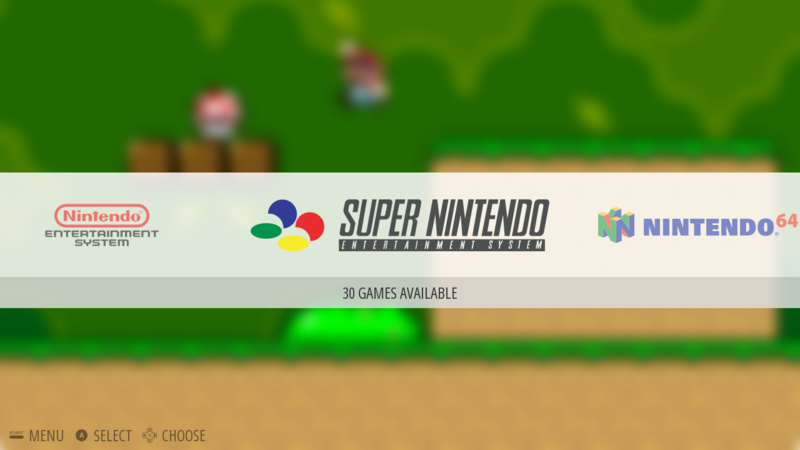 An actual website: https://www.emulationstation.org. Huge thanks to Nils for design suggestions/tweaks, as usual. It includes a detailed “Getting Started” page. Visit the download section on the new website! Expect bugs! We are literally just two people, a single person doing programming and a single person doing QA. When they happen, post them to GitHub (but make sure you’re not making a duplicate issue! Check closed issues too!). Note: the “version 2.0” code is currently in the “unstable” branch of the git repository. Once things are working fine, it will be merged into the master branch. The RetroPie blog will have a post about the updates to the RetroPie Setup script soon, if you’re using the Raspberry Pi. This entry was posted in releases on June 29, 2014 by Aloshi.